CarGurus has 6,412 nationwide ES 350 listings starting at $1,300. The entry-level luxury sedan market offers a wide range of options, most aimed at the person who wants something sporty. But for those who want a spacious sedan with the comfort level of a La-Z-Boy couch, the 2017 Lexus ES 350 is worth a closer look. For 2017, Lexus has improved the ES 350’s safety credentials by making a number of features previously available only as an options package standard, such as adaptive cruise control, pre-collision braking with pedestrian detection, lane-departure warning, lane-keep assist, and automatic high beams. The ES 350 now also comes with Scout GPS Link, which uses an Android or iPhone app to provide navigation and traffic information through the infotainment system. It has a starting price of $38,900. The ES 350 has never been known as a sharp looker or a vehicle that stands out in a crowded parking lot, but in 2016 Lexus decided to change that by adding a contentious new front end with a larger grille and LED headlights. The rest of the ES 350’s exterior has remained mostly unchanged since its redesign in 2012. 17-inch alloy wheels come standard, but 18-inch wheels are an available option. The car’s interior is conservative in design but richly appointed with soft-touch materials and wood trim. Whether you find yourself sitting up front or in the back, there’s plenty of space to stretch out. Seats are covered in Lexus' NuLuxe faux leather, with real leather as an available option. Trunk space measures 15.2 cubic feet, which is average for the class. Disappointingly, the ES 350 doesn’t offer folding rear seats to increase cargo space. The ES 350’s standard infotainment system features an 8-inch Display Audio screen with the updated Remote Touch Interface controller. However, critics have given the interface mixed reviews due to the controller’s sensitivity. Optional technology upgrades include a 15-speaker Mark Levinson audio system, improved navigation, and the Lexus Enform App Suite, which provides access to various mobile applications such as Pandora and Yelp through the infotainment system. Under the ES 350’s hood is a 3.5-liter V6 engine producing 268 hp and 248 lb-ft of torque paired with a 6-speed automatic transmission and front-wheel drive (FWD). The ES 350 can reach 60 mph in just over 7 seconds and has fuel-economy figures of 21 mpg city, 30 highway, and 24 combined. Lexus offers a driving mode selector with 3 settings—Normal, Eco, and Sport—that alter throttle response, steering, and other mechanical bits. The ES 350 also provides one of the quietest rides in its class through the use of sound-deadening material that keeps the noises from the world outside at bay. For safety, the 2017 ES 350 comes with 10 airbags (including knee airbags for the driver and front passenger), stability control, traction control, a reversing camera, rain-sensing wipers, and Lexus Enform Safety Connect—a telematics system that can contact emergency services in the event of a collision, locate your vehicle if it’s stolen, and call for roadside assistance. Oddly, blind-spot monitoring with rear cross-traffic alert is not standard. Both the National Highway Traffic Safety Administration and Insurance Institute for Highway Safety have awarded the ES 350 their respective high honors: a 5-star overall rating and a Top Safety Pick+. 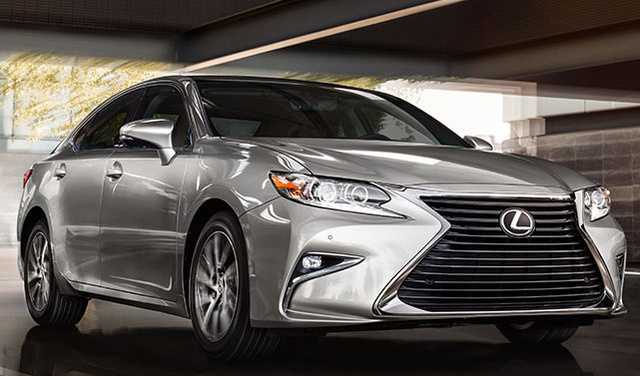 What's your take on the 2017 Lexus ES 350? Users ranked 2017 Lexus ES 350 against other cars which they drove/owned. Each ranking was based on 9 categories. Here is the summary of top rankings. Have you driven a 2017 Lexus ES 350? Tire pressure light is on, I wanted to know which tire is low, does it display the actual tire pressure anywhere?